Poets of the Second World War were naturally influenced by their predecessors in the First. The post-war generation grew up hearing and reading about the Great War (for the full, classic treatment on these understatements, see Fussell, The Great War and Modern Memory). 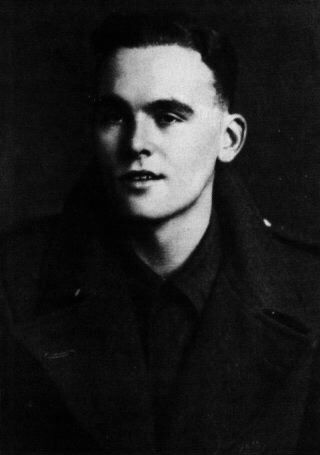 It's easy to understand why Welsh poet Alun Lewis (1915-1944) a soldier in the Second World War, should appreciate Great War poet Edward Thomas. Thomas' direct, unadorned language, and keen eye for detail have helped his reputation to grow steadily since the great war. Lewis' sympathetic poem "To Edward Thomas" appreciates the simple, yet at times impoverished life of Edward Thomas, while it celebrates his talent and laments his loss. Brigham Young University was fortunate to have on its English faculty one of the greatest poets of the late 20th Century, and one of the greatest of all Welsh poets: Leslie Norris (1921-2006). 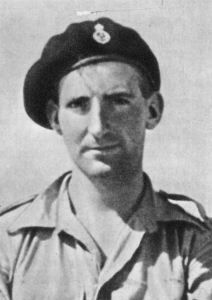 In addition to being a gifted poet, Professor Norris (a veteran of the Second World War) was also an expert in Great War literature, and an appreciator of Edward Thomas--who was the subject of two of Norris' poems. Ransoms / Leslie Norris. -- London, Chatto & Windus, 1970. Includes the poem "Ransoms (for Edward Thomas)." Selected Poems / Leslie Norris. -- Bridgend, Mid Glamorgan : Poetry Wales Press, 1986. Includes the poem "A Glass Window, In Memory of Edward Thomas, at Eastbury Church." Collected Poems / Leslie Norris. -- Bridgend, Wales : Seren, c1996. Leslie Norris' father was a soldier in the Great War, and is remembered in the poem "His Father, Singing." (Click here to see the article) Norris, Leslie. "Where the crakeberries grow -- Robert Graves gives an account of himself to Leslie Norris." The Listener 28 May 1970: 715-716. 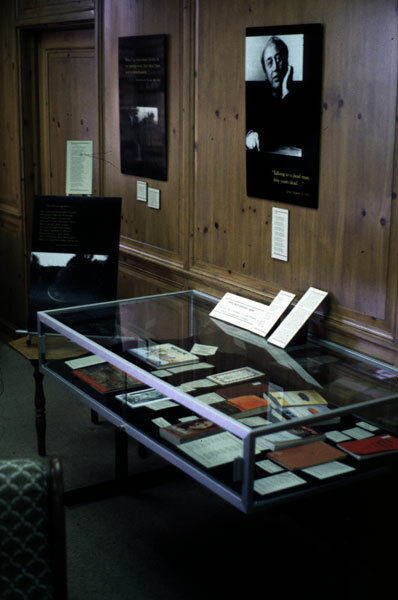 For more information on Leslie Norris, including critical studies of his poetry about Edward Thomas, click here to enter the Leslie Norris Critical Bibliography. Philip Larkin (1922-1985) recalled that prelapsarian summer of 1914 (although he had never actually experienced it -- so strong is the myth of the Great War in our modern memory) in "MCMXIV" ("1914"). Martin Stephen used the last line of Larkin's poem, as the title for his 1988 anthology: Never Such Innocence: A New Anthology of Great War Verse. When Vernon Scannell (b. 1922), a veteran of the Second World War, thinks back on war, it is "The Great War" that comes to mind. Roger McGough (b. 1937) mocks the attitude that sent young men to the slaughter of the Western Front in "A Square Dance." 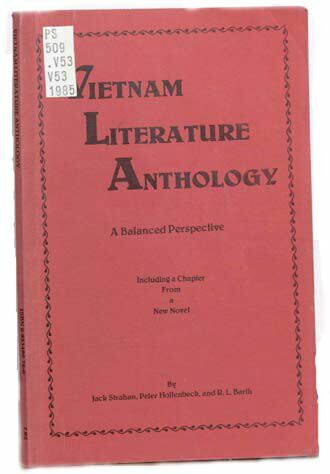 Vietnam Veteran and contemporary American poet, R. L. Barth invokes the spectres of Owen, Blunden, and Sassoon, in his poem "A Letter to the Dead." Birdsong / Sebastian Faulks. -- 1st Vintage International ed. 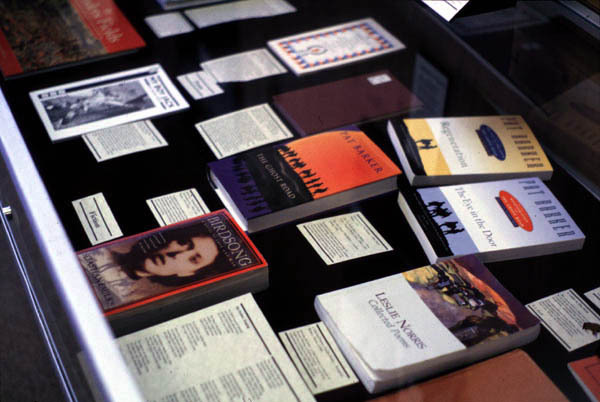 -- New York : Vintage Books, 1997, c1993. A gripping story of war under the trenches, in the troglodyte world of the tunnels. A truly remarkable book: Faulks reaches back 80 years and tells the nightmarish story of the Somme and Passchendaele with the same uncanny understanding that Stephen Crane had as he looked back and wrote The Red Badge of Courage 30 years after the American Civil War. Faulks' character development, attention to detail, and gripping descriptions of battle combine to make Birdsong a masterpiece on a par with Michael Shaara's Killer Angels. Regeneration / Pat Barker. -- New York : Plume, 1993. The Eye In the Door / Pat Barker. -- New York : Penguin Books USA., 1995, c1993. The Ghost Road / Pat Barker. -- London : Viking, 1995. Not About Heroes : the Friendship of Siegfried Sassoon and Wilfred Owen / by Stephen MacDonald. -- London ; Boston : Faber and Faber, 1983. 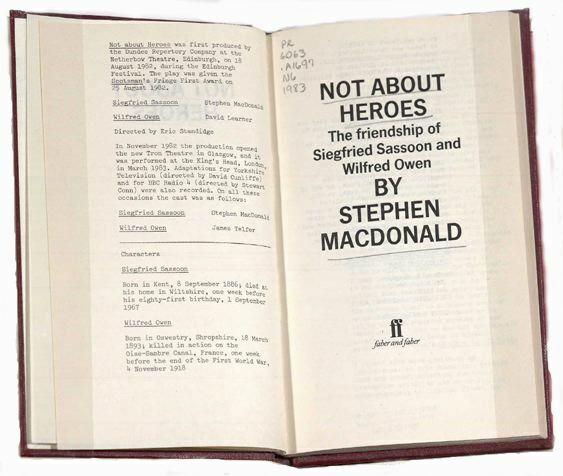 Stephen MacDonald in Not About Heroes dramatizes the meeting and friendship of Siegfried Sassoon and Wilfred Owen at Craiglockhart War Hospital (where both men were patients). Suffering from shell-shock, Owen arrived at Craiglockhart on June 26, 1917. Siegfried Sassoon arrived in late July. Wounded earlier that year, Sassoon had been sent to Craiglockhart (under the ruse of being shell-shocked) in lieu of being court martialed for going AWOL after making his famous protest statement against the war. Owen introduced himself to Sassoon around the 17th of August, and the two men became friends and critics of each others' poetry. 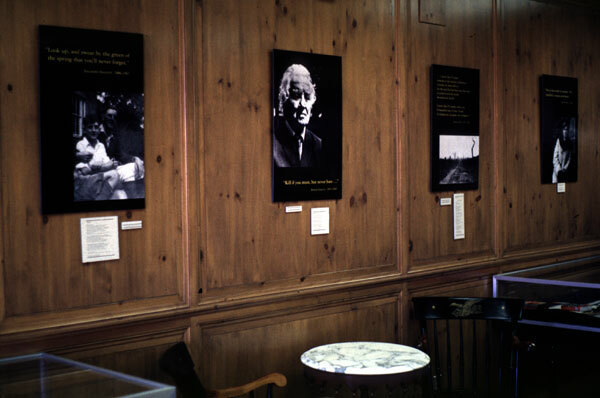 Sassoon had a profound effect on Owen's work through his poetic mentoring, and by introducing Owen to his London literary connections. Sassoon also collected and edited the first edition of Owen's work brought out in 1920. Observe the Sons of Ulster Marching Towards the Somme / Frank McGuinness. - London : Faber & Faber Ltd., 1986 (reprinted 1990). Because of the annihilation of the Ulster Division at the Battle of the Somme, July 1st "is still a day of deep mourning in Ulster" (Fussell 316). July 1st, 1916, the first day of the Battle of the Somme, was, coincidentally, also the anniversary of the Battle of Boyne in 1690, when the forces of William III defeated the Roman Catholic James II. Therefore, as Keith Jeffery remarked in The Times Literary Supplement, the Somme . . . "has, like the Boyne, come to have a sacred place in the Loyalist Protestant mind. It marks the Union sealed with blood. 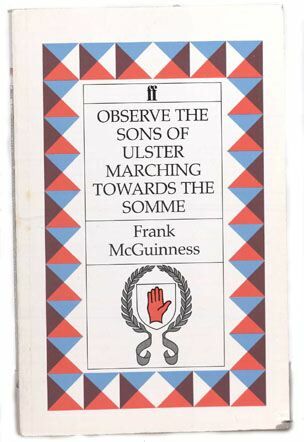 It stands for the ultimate test of Ulster's loyalty; a blood-sacrifice to match any made by Irish nationalists" (back cover of Observe the Sons of Ulster Marching Towards the Somme). A story for anyone wishing to better understand the history of and current state of affairs in Northern Ireland. Also, a story of the tragedy that befell many regional units and "Pal's Battalions" which were formed up from members of the same villages, towns and neighborhoods. These same villages, towns and neighborhoods were then devastated when their young men were slaughtered together in the major battles on the Western Front (see also Michael Forman's War Game). Similar tragedies happened to regional units in the American Civil War, and to U.S. National Guard units in World War I and II. 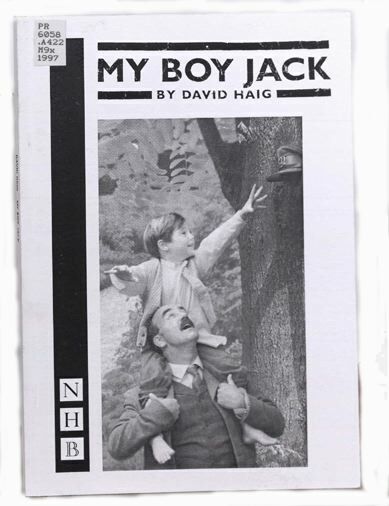 My Boy Jack / David Haig. -- London : Nick Hern Books, 1997. 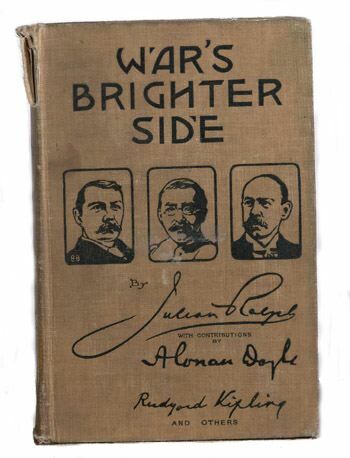 War's Brighter Side : The Story of "The Friend" Newspaper Edited by Correspondents With Lord Roberts's Forces, March-April, 1900 / by Julian Ralph ; with contributions from A. Conan Doyle, Rudyard Kipling ...<et al.> and a letter from Earl Roberts. -- New York : D. Appleton, 1901. 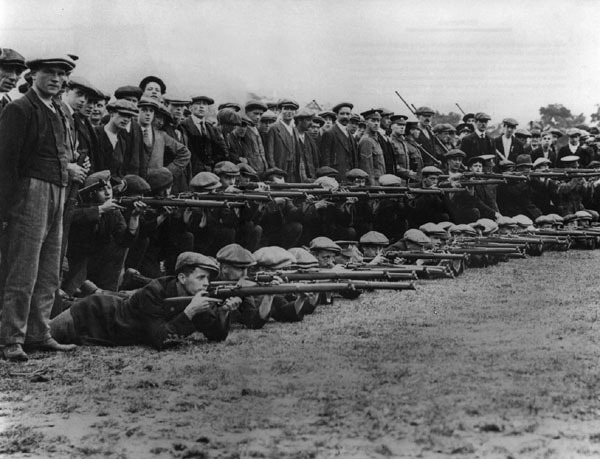 The Boer War (1899-1902), fought in South Africa, far from England by the small, professional British Army -- the regulars -- obviously didn't effect the English psyche in the way the Great War did, which drew out and sacrificed men and boys from all classes of British society. Kipling wasn't the only popular writer who contributed to War's Brighter Side, Arthur Conan Doyle also added a few pieces. And just as Kipling would, Arthur Conan Doyle would later lose a son in the Great War -- and a brother, and a brother-in-law. "The creator of Sherlock Holmes, the ultimate rationalist" became a "tireless missionary for the cause of spiritualism," and a believer in seances for contacting his dead son, Kingsley (Winter and Baggett, 382, 384-85, 387). The most popular performer of the day, singer and comic Harry Lauder, also lost a son in the war. And even Prime Mister Harold Asquith lost a son in the Great War, Raymond, killed during the Battle of the Somme in 1916. After his son's death, Asquith didn't have much enthusiasm for the war (Winter and Baggett, 188), and later that year failed in his bid for re-election, and Lloyd George became Prime Minster. The Prince of Wales -- later to become King Edward VIII (1894-1972) -- was a contemporary of the war poets. The Prince served from 1914-1918 as an aide to General Sir John French who commanded the BEF for the first 16 months of the war, before losing his command to Sir Douglas Haig in December 1915. The Prince of Wales was not the only member of the Royal Family to serve in the war, the Prince's younger brother, the Duke of York -- later to become King George VI (1895-1952) -- served in the Royal Navy and fought in the Battle of Jutland (1916).